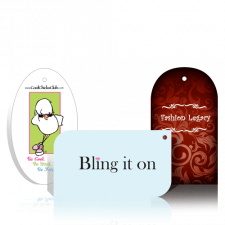 Hang tags are must for any retail business. 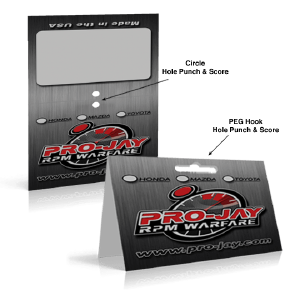 Our full color hang tags come in plenty of sizes to suit your inventory. Get even lower prices when you buy in bulk! Showcasing your products at retail outlets can be a nerve-racking experience. You want the presentation to be as good as possible. With hang tag printing by PrintFirm, you can be confident that your products will have consistently high quality tags. 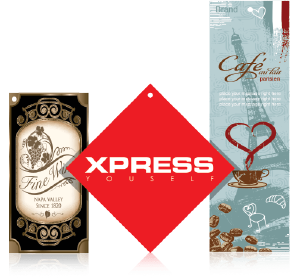 You have a choice of flat hang tag printing or folded hang tag printing. All of our hang tags are printed on durable 14-point card stock. Our flat tags come in 11 sizes ranging from 2” X 2” all the way up to 3” X 7”. Printing can be on one or both sides. You have the option of a glossy UV coating that repels dirt and moisture or a non-UV coating that is matte in appearance. Available hole punch positions are top left, top center, and top right. The corners can be rounded for a non-standard look. Available corner radiuses are 1/8 inch and 1/4 inch. PrintFirm’s folded hang tags have six available sizes ranging from 4” X 7” to 5” X 9”. Printing can be on the front only or the front and back. In order to allow for a more attractive fold, these tags are mechanically scored, which means that a crease is created. You receive a top center hole punch option or a top center butterfly punch that gives the product better placement for some retail product hook layouts. UV coating and rounded corners are available. With hang tag printing, we do not recommend that you make your main product font too small. A customer should have the ability to view the product name without removing the product from the retail fixture. Crowding the design with other graphics and text is not a good idea either. A cluttered design results in an unprofessional appearance. If you must include the additional graphics and text, PrintFirm recommends that you select a larger hang tag size so that the design elements are in balance. You can upload your hang tag printing design to our website along with any artwork, photos, and text. If nobody in your organization is skilled in graphic design, you can select an ordering option called “custom design service”. In that case, our team of talented graphic artists will create your design. You can still upload any company-specific artwork and text to our graphic artists and they will incorporate them into the layout. PrintFirm recommends that any uploaded images have a minimum resolution of 300 DPI (dots per inch). Lower resolutions may look fine on your screen, but once they are printed out, they will look fuzzy or pixelated. Practice caution when using images found online because they are typically low resolution. To check the DPI of an image, open it in a reputable graphic design program and make a note of the file details. Proofread the text in your design carefully before submitting it for hang tag printing. One small text mistake can ruin your entire printing run. Ideally, more than one person should proofread the design in order to catch mistakes that one person may miss.